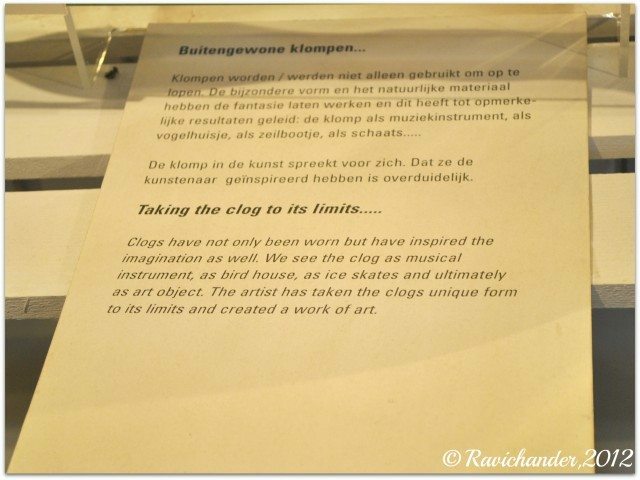 Alluring Amsterdam - Part 3 - Ghumakkar - Inspiring travel experiences. Amsterdam is famous for a lot of things. The night life, the canals, the legalized grass & weeds at “Coffee shops”, diamonds, museums and the like. But beyond all this, I wonder if anyone would want to know more about the city and its surrounding villages! With such an intent, we decided to spend our Day 3 exploring the nearby villages around Amsterdam. Amsterdam is a city of bicycles. So, we had an option to hire a bicycle and go cycling to these villages from the nearest train station OR to book a guided tour through Tours and Tickets. Since the weather wasn’t too favorable for cycling, we decided to opt for the guided tour. A 6 hour round trip with a visit to the cheese and clog factory plus walk tour in the fishing village of Amsterdam – cant get any better, can it? It was a fully packed bus with a charming guide who easily spoke about 8 languages! As soon as she learnt that we were from India, her face lit up with joy :) Apparently, she has served as a tour guide in India for about 6 years! She shared her experiences as we traveled together through out this trip. 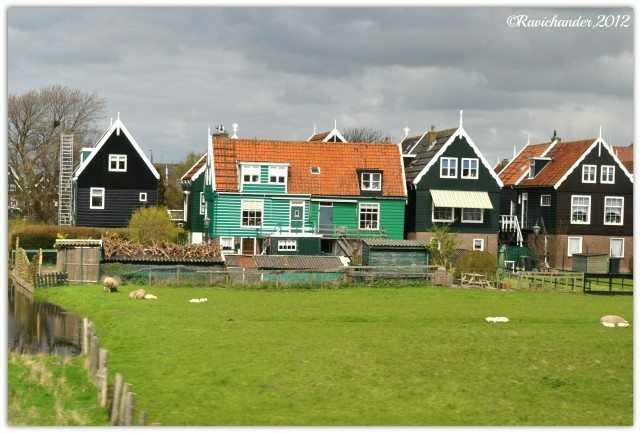 Within no time, we reached the Dutch village Marken – where we walked with our guide and saw a few of the typical Dutch houses. I must mention here how beautifully they were decorated. While some had beautiful artifacts by the window side, others had small but well kept lawns; some had themes in their garden while others had nothing but still looked so elegant! The walk tour revealed some of the most untold facts about the Dutch. We were told that in one such house, the traditional clog factory was set up. It is from here that, even to this day, most of the clogs are supplied to the markets. 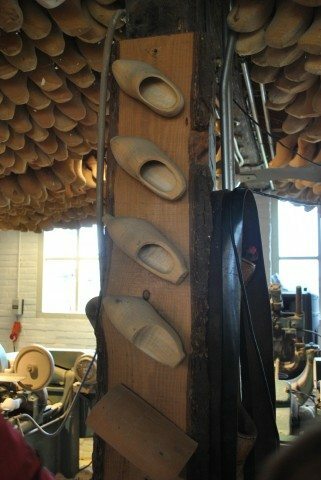 For all those who do not know what clogs are, well, they are the traditional wooden shoes of the Dutch. The Dutch farmers and country folks wear it even to this day because of 2 important reasons – 1. It is their traditional footwear, 2. It is an “all-season”, “all-occasion” footwear. 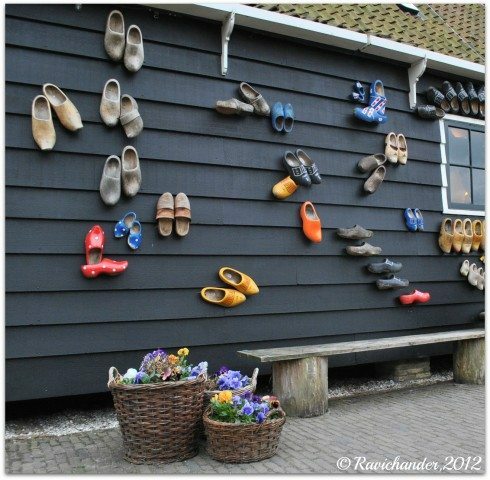 I guess the Dutch are lucky – they don’t have to keep buying shoes of different variety! 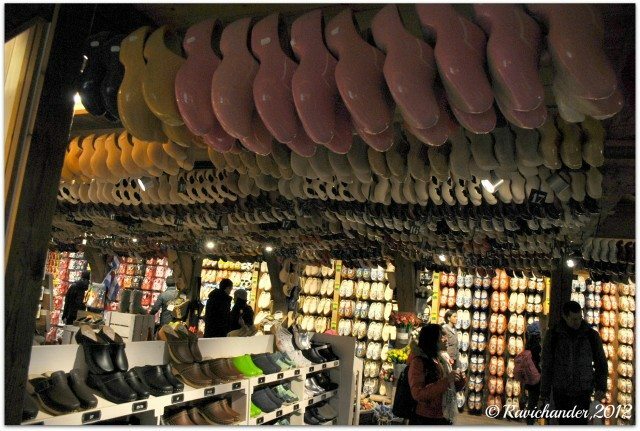 We walked until we reached a Clog factory – the place where a family still makes most of the clogs that is supplied to Amsterdam and to many other parts of the world. Here, we learnt the process in which, blocks of wood get transformed into light weight, robust and low maintenance shoes. 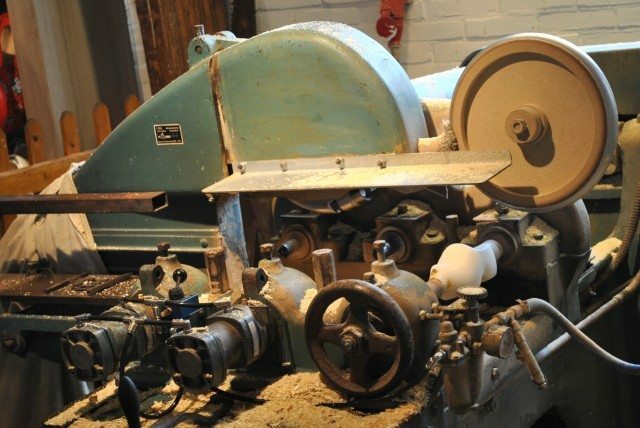 It is surely an interesting place for mechanical engineers too – they get to see some traditional lathe machines here! Block to clog – the stages. 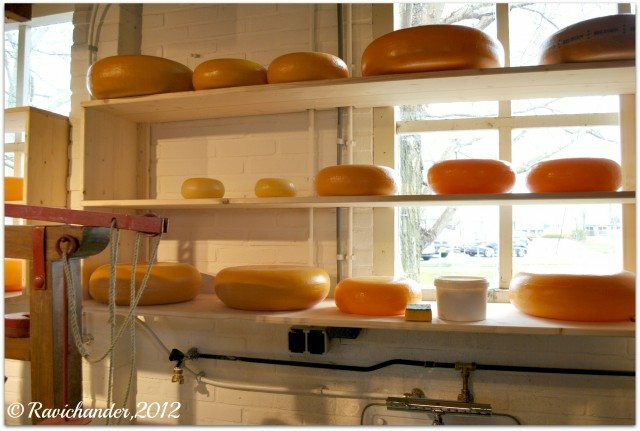 In the same house where clogs are made, there is a section where the cheese making process is demonstrated. 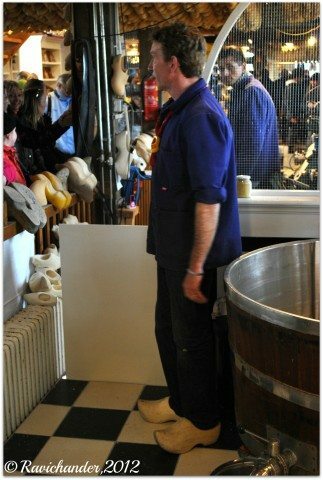 It was an interesting explanation and I was on my toes to go to the next part of the tour- cheese tasting !! Learning how to make cheese! This is a paradise for all cheese lovers like me- a one-stop shop for tasting and buying a large variety of cheese! Goat cheese, sheep cheese, cow milk cheese, young goat milk cheese, cheese with herbs, garlic and herbs cheese, smoked cheese- made of goat milk and cow milk etc ! I ate to my heart’s content and never worried about how many calories it amounted to ! 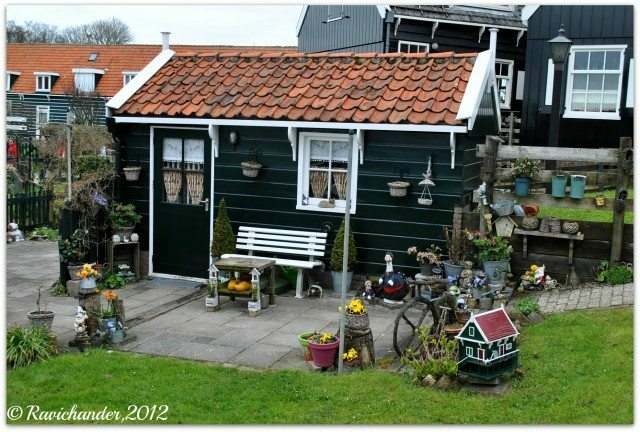 From here, we had to take a boat to the next destination – Volendam, the Dutch fishing village! In less than 15 mins, we reached the vibrant village of Volendam! It was a magnificent welcome in my opinion because the weather was fabulous and the place was completely touristy. Food and souvenir outlets spam this place. There is something so charming about the place that it instantly arouses your interest and makes you feel so lively. After a long walk around the village if your tired feet need pampering, then, there is a fish spa too offering a 20 minute treatment! We had a quick lunch here (vegetarian options – Burger and Fries.. ONLY!!) . 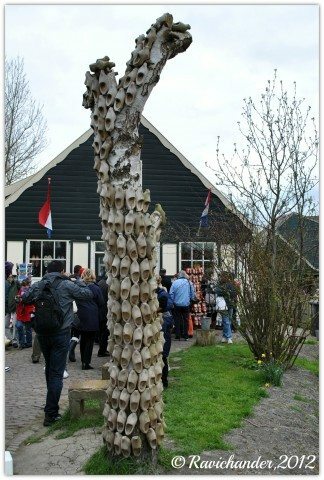 We were given some time for shopping and to just laze around after which we advanced towards Zaanse Schans – the Windmill village! This time, the journey was by bus and in about 25 mins, we reached the windmill village. This place is my personal recommendation to all travelers who are planning their Amsterdam trip. 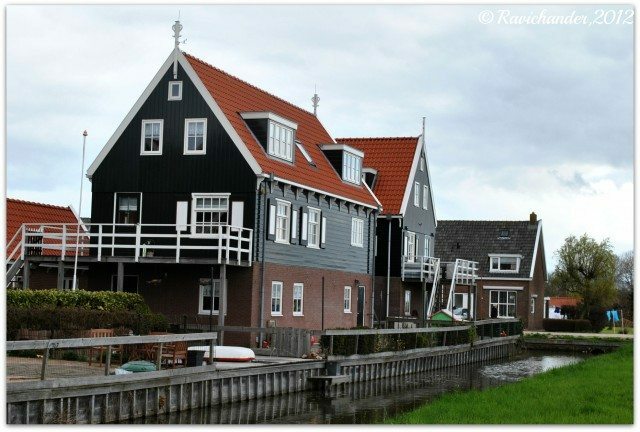 A complete get-away from the madding crowd of Amsterdam; a stress-buster village; a totally scenic and romantic place for all genres of travelers! The weather, not to mention, was its best – slightly gloomy, breezy and so cool that it swept off all the fatigue as the air blew over my face! The windmills here are open for travelers. By this, I mean to say that owners of these windmills allow the tourists to climb until the top of it to get a panoramic view of this village. Unfortunately, it was nearing 5 pm when we reached this place and most of the windmills except a small one, were closed. 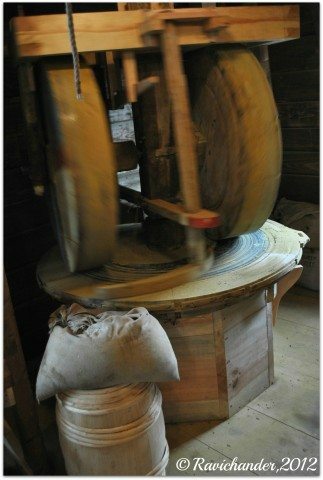 The one which was open was using the energy from windmills to run a spice-grinder- i.e. 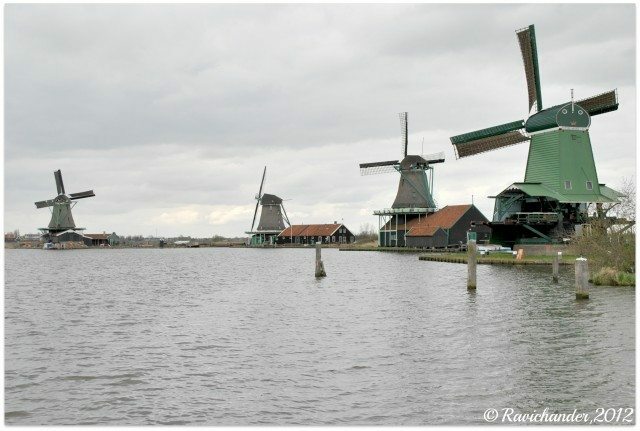 they made powder of spices using the energy obtained from these windmills! The combination of the smell of wet wood of the exterior (due to slight drizzle) and the aroma of the spices from inside the windmill was enough for me to fall in love with the place, all over again. It is an experience which is inexplicable! The creaking door of the museum opened into a world of colorful and artistic clogs! Small, medium, large, extra large & larger than life-sized clogs covered the entire museum. I would not be exaggerating if I said that there were as many clogs here as the number of bees in a hive or even more than that! The museum was too colorful to resist falling in love with each exhibit! What variety, what colors – everything in abundance.. except time! As we drove back, I couldn’t keep my eyes closed. I wished to capture every scene that passed by in my mind and to play it back and forth anytime in future when I wished so! An enticing and marvelous trip it was! It probably boosted my energy levels higher than what the city’s “Coffee-shops” could do! I was smitten.. And vowed to come back here again.. and again! We returned to the hotel and relaxed our body while our souls were already relaxed! Another well spent day, another trip to remember.. Another post on Ghumakkar – yes, the decision was made then! Thanks Surinder for the comment..
Oh! Archana , once again a mind blowing post . What a wonderful place is Holland. Very fortunate to see country side of this great country. Loved each and every aspect of your classy post . Feels like going there to live there forever. 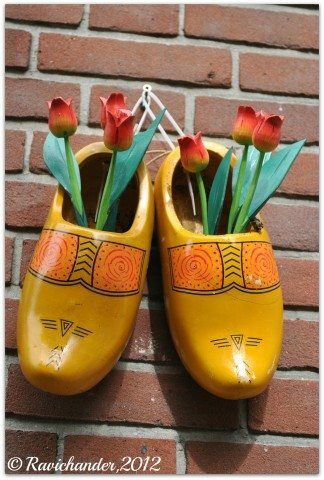 Very beautiful pics and description on clogs. TAKING CLOG TO ITS LIMITS was ultimate. The first pic looks like a model, a beautifully crafted one. Difficult to believe that it is a living house. Thank you. Thanks for sharing such a wonderful series with all of us. In the clog museum that I visited, I did see a clog which looked like it has its origin from India :) Like those worn by the sages.. is Kharaon the same thing? Lovely post, Archana; it was really engrossing. The pictures look post-card perfect. Glad to know from you that people’s faces light up on seeing Indians; sad that Indians do not seem to be happy at seeing their compatriots abroad as Silent Soul had mentioned earlier. Windmills, at last. The first thing that comes to mind when Holland is mentioned are windmills (before Yash Chopra came along with those visuals of Tulip farms in his movies). Sad that you could not make it in time to give us more visuals of the interiors of a windmill. In India, we too have wooden sandals which are flat pieces of wood with a vertical peg which is gripped by the big and second toes. The first, last and only time I wore that contraption was at my wedding, as a part of the traditional rites. Really uncomfortable; I think that walking barefoot is a better option :-). Jokes apart, I seriously wonder whether these wooden clogs are comfortable, unless they are worn with a cushioned insole. And, I am sure that they make a helluva noise. Windmills are more like a trademark of Holland.. The souvenirs and even the clogs have windmill pictures on them.. It is so significant ! 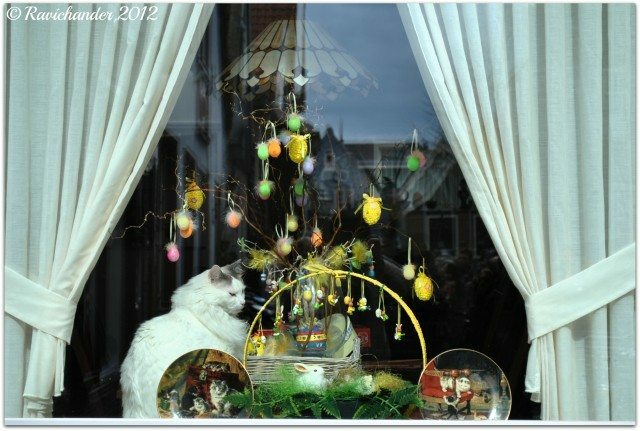 As much as Ravichander has served the purpose to imprison the beauty of typical Dutch Houses, the artifacts, clogs, variety of cheese, windmills through his camera, the more is the rich description by Archana. While reading the post, I was enjoying each and every scene particularly when Ravi enforced you to leave the museum. 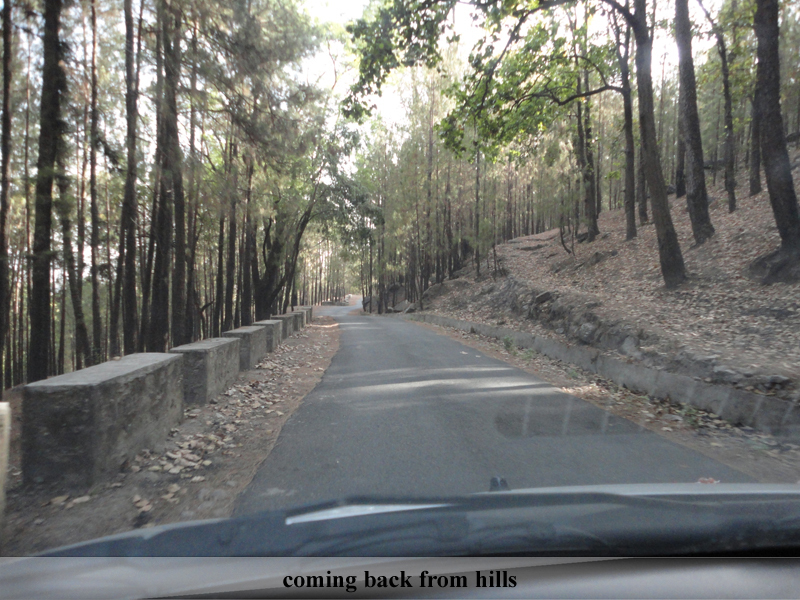 Lansdowne….let the lands down, come up in hills.